Hotblack Desiato was born in July 2012. She was such a sweet, tiny little calf. Dora is her dam (mother) and Dougall her sire (father). In comparison to G-Zeus, she was up and on her feet, out munching grass with the rest of the herd very quickly, about day three! G-Zeus layed around in the shrub where Mum hid him for at least a week. We were so pleased to see that she is polled, taking after her father. The poll gene is dominant, so a calf only needs to inherit one polled gene from either parent to display the polled characteristic. The genetics with cattle, particularly dexters, especially fascinates me, and I will write more about this in depth, later. G-Zeus gets a little sis to play with, Hotblack. 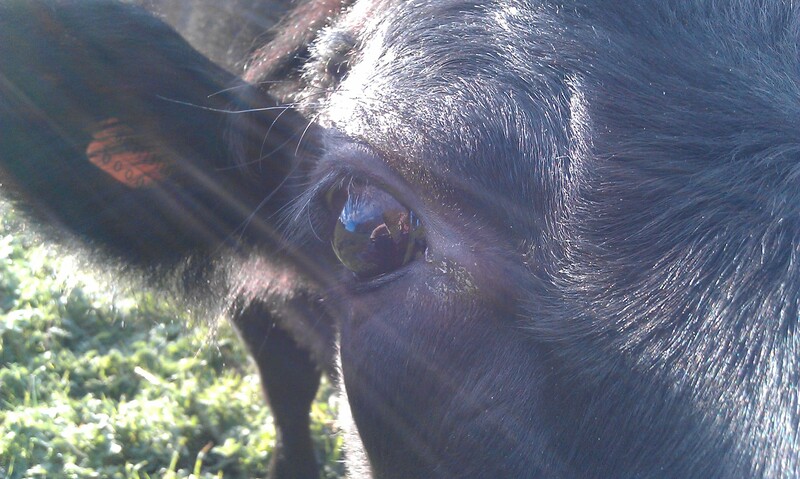 I halter trained her from a young age, she is a very friendly and easily handled cow now. Hotblack, while still quite young, one day started nodding her head up and down vigorously when I was near her. She kept doing this, and I reached out to touch her head. Ah-ha. She wanted a scratch. She loves scratches on her brow, behind her ears, and around the back of her head. Apparently it is a little unusual for a cow to like their head being touched. When you reach out a hand to her head, if she is up to it, she vigorously nods her head, yes please, scratch me! Hey, you with the camera, put that thing down and give me a scratch! Taking after hre mother she is quite a small cow. Just after Christmas 2012, I noticed Dougall paying attention to her as if she was in season. I was unaware that a heifer that young could be ready to procreate, I thought they were pretty right until about 8 or 9 months… not so with dexters apparently! I took action, separating her from the bull – and each day twice a day had to let Dora in to join her as HB was still suckling from Dora. After three days had passed, it was safe to let her back out again. Three weeks later with her coming back into estrus I separated her again, but alas, as it turns out, I was too late. She was pregant, at seven months of age. As I talked about in this post, we let her go through with the pregnancy, trusting nature to get it right. Totally not pleased with this separation business! HB had a lovely little bull calf, John Boy, the story of his arrival I told in the aforementioned post. At that time we planned to call him Jose, we later decided on John-boy instead. John-boy is also polled, and he’s a cute little fellow. 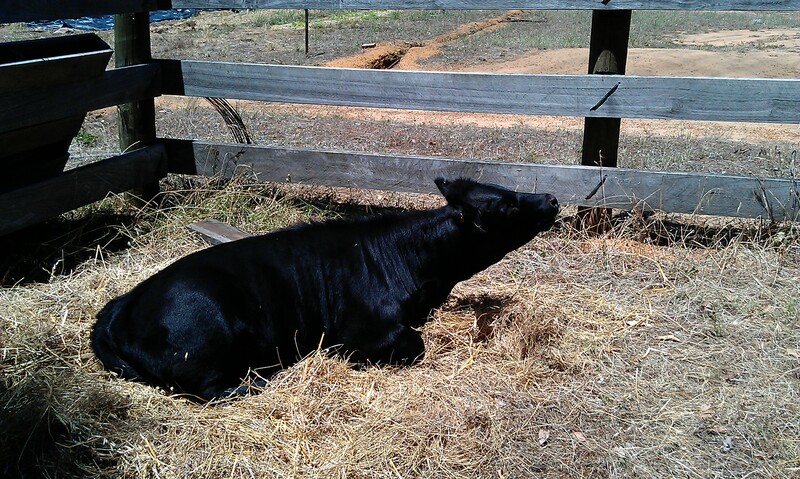 HB has been well handled since she was small, and even after her first calf she did not object at all to being milked. She’s a sweetheart, and possibly, if I had a favourite, it would be her. 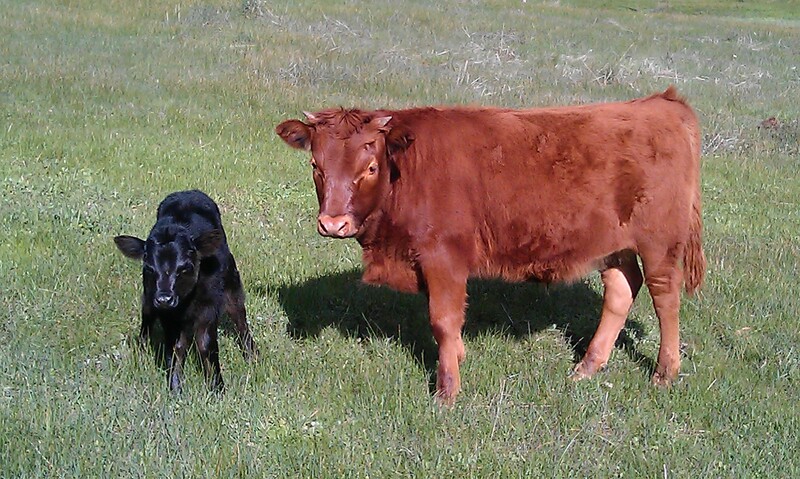 This entry was posted in Cattle, Farm and tagged cattle. Bookmark the permalink.